Periodically I hope to highlight useful (or maybe even more rarely, not so useful) apps and the ways in which I use them. These posts aren’t designed to be exhaustive reviews though. If you’d like a more in depth look at the currently highlighted app, please leave a comment to that effect! Today I wanted to feature the new release of Day One (perhaps unhelpfully called Day One 2. Day One is a personal, digital journal designed from the ground up to produce simple and beautiful daily journals of whatever you are interested in tracking. 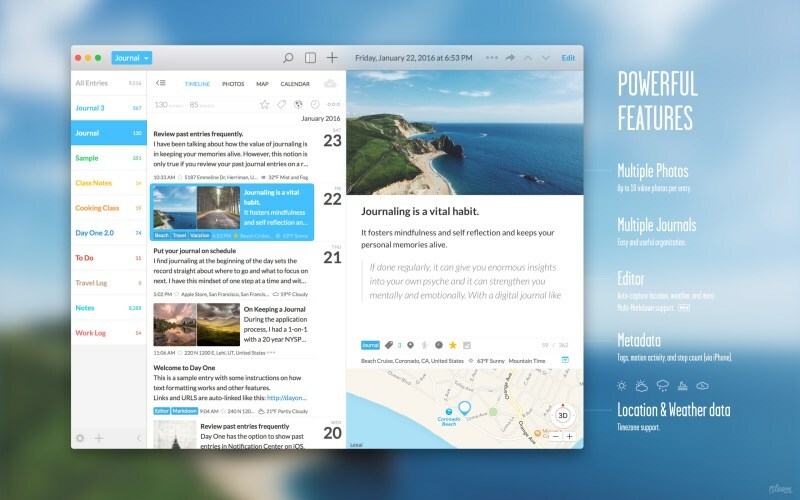 It syncs across the Apple ecosystem so your journal(s) are with you wherever you need them (on Mac, iPhone, or iPad). There is lots to love about Day One 2. It’s creators bill it as simple and elegant and it is. All text input is done as markdown (a plain text system that is just fantastic to use) and it is designed to handle media really well. Making a photo gallery of the day is also quite simple (which is particularly useful when you have small children). In the new version, you can also create multiple journals which is particularly useful. I have a work journal where I keep debrief notes about work, a personal journal that houses personal thoughts and then a lifestream journal that collects my online activity for remembrance. The latter mentioned journal (the lifestream journal) makes use of a brand new features that really makes Day One 2 stand out: IFTTTintegration. IFTTT is an online automation tool that “links” apps together in tons of useful ways. I have recipes for IFTTT that automatically make journal entries for all of my posts on the primary social media tools I use. This way, I have a running log of my online activities (including from this blog!). There is a lot that you could do with IFTTT integration to automate the journaling process. There isn’t honestly much I dislike. Two things do stand out that I wish were different. The first is that I wish there were different sync options. In version 1, you could sync via Dropbox (for example) but you are limited solely to Day One’s sync service in the new version. I understand why (features like IFTTT integration depend on this) and will be happier about it when full private key encryption is in place (a projected feature of version 2.1). It would still be nice to have a teensy bit more control of our data. The second thing I’ll mention is publishing. This was a late flagship feature of version 1 that has yet to find its way into version 2. It’s not something I often used but it did have compelling use casesand it will be nice to see it integrated back into Day One 2. Day One 2 is an app I find really useful. A personal goal over the past few months has been to focus in on and hone my writing skills and it’s been an aid to that end (as well as a great place to log who I am and what I do). I don’t know of a better journal-focused app. I’d encourage any to check it out, if journaling is your thing (or something you want to work on). I barely scratched the surface of its features. Check out it’s sitefor more info and screenshots!